KAMPALA – MPs on the Committee on Commissions, Statutory Authorities and State Enterprises (COSASE) on Wednesday afternoon tasked officials from Bank of Uganda to explain why they paid city law firm MMAKSs Advocates in foreign currency despite the fact that the legal advisors had filled their invoices in Uganda shillings. 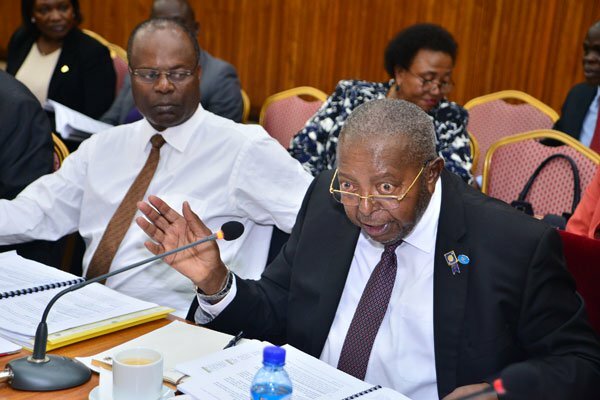 During the inquiry, the MPs also accused Bank of Uganda of showing no confidence in Uganda’s currency by choosing to ignore local currency in preference for foreign currency. While appearing before the Committee on Tuesday lawyer Timothy Kanyererezi Masembe, a Partner at the under fire law firm retained by Bank of Uganda in the liquidation of Crane Bank Ltd told confirmed to the committee they were paid USD 230,000 (approximately Shs759M) as per 2017 exchange rate. Of this amount, USD93,872 was billed on hourly basis totaling to 432.59 hours and this was based on a blended Partner/Associate rate of US Dollars 217 per hour. On the other hand, USD 136,128 was billed on drawing and negotiating the terms of the Purchase of Assets and Assumptions of Liabilities Agreement based on the Shillings 200 billion cash consideration for Crane Bank assessed at a discounted rate of 0.24%. Twinemanzi Tumubwine, Executive Director Banking Supervision while responding to queries raised in the special audit report on the Shs478Bn injected in Crane Bank as liquidity support by Bank of Uganda at the time the financial institution was under statutory management, admitted that Bank of Uganda had no guidelines for the liquidity support. He agreed with auditors that there is need for the Central Bank to review its liquidation support guidelines including details of operating procedures for the said plan. With the Committee learning that Deputy Governor, Louis Kasekende approved all payments to Crane Bank’s liquidity support, MP Odonga Otto (Aruu County) tasked him to provide the legal instrument he used to authorize such payments and minutes of the meeting on how they arrived at the figure, to commit tax payer’s money to Crane Bank’s bailout. It was then that Mbarara Municipality’s Michael Tusiime tabled a letter authored by Secretary to Treasury on 15th January 2016, warning all accounting officers from paying contractors in foreign currencies, save for contracts that were running before the time of the directive. The Deputy Governor told the Committee that the Bank would fund the shilling account of Crane in Bank of Uganda as the Central Bank is the one unique institution where they can create a liability matched with the assets. However, Tusiime insisted on having Dr. Kaskende explain why he paid local contractors when there is a bar from the Treasury to execute these payments in foreign currencies. Anita Among, Vice Chairperson COSASE wondered whether the Central Bank makes its budgets in local currencies to warrant it pay its local suppliers in foreign currencies. With back and forth debate on the matter, the Committee requested the Central Bank to provide a written response.